Baby Carlos started his life as a fighter born to this world pre-mature at only 2 pounds he was abandon in the hospital by a mother addicted to drugs. Baby Carlos also addicted had to endure the struggle of withdrawal symptoms at such a fragile stage. However, I know God has a purpose for this miracle from above because baby Carlos managed to fight for his life and made it through. My grandson Carlos joined my home at the tender age of 3 months. My life changed when my son came to me and asked for help in caring for my grandson Carlos. With no hesitation my significant other and I welcomed him in as our own. He was growing healthy and strong learning at his own pace when tragedy struck on September 17, 2018. My beautiful fun loving innocent grandson/son endured a series of seizures and as a result his brain was deprived from oxygen which ultimately lead to an Anoxic Brain Injury and now on about 8 medications which includes Phenobarbital, Keppra, Clonidine to name a few. Carlos is now living his little life immobilized, on a feeding tube not able to just be a 2 year old. We still have multiple hospital trips miles away with a car that is over 18 years old barely running, shut-off notices, finances are all but gone and months behind on everything but we are determined that yet again he will make it through and we won't allow the devil to put doubt in our hearts. I say My God will make him whole again he will be a great testimony showing that God is an awesome God. First, the doctor's all said he wasn't going to make it when he first arrived at the hospital and he did. Then they doctor's said he would need a trachea operation. We put in a prayer request from our prayer warriors and glory be to our God we were told he wouldn't need one. And on top of all this we are now encountering issues with his medical insurance to accept certain treatments that could improve his condition. 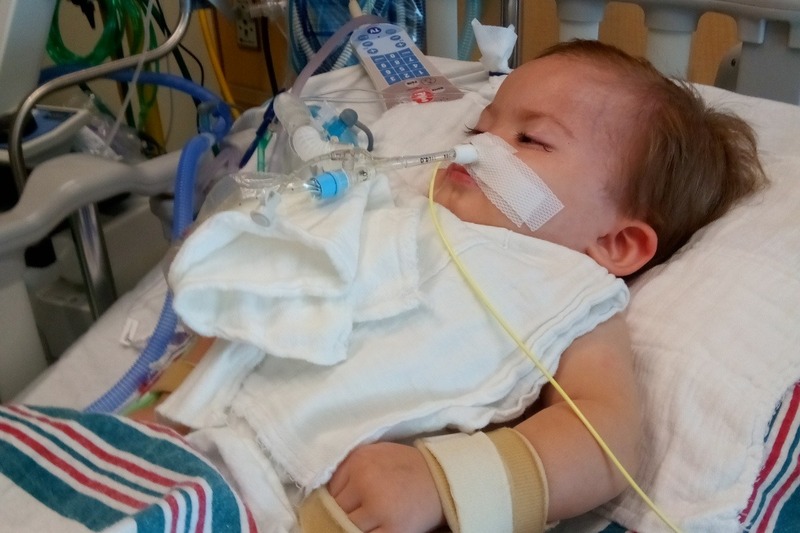 We hope to raise enough funds to assist in taking him to Ann Arbor or Chicago Children's hospital which specializes in the type of care that is needed for his condition. This little boys recovery is not simple and not over we need to continue to travel to hospitals and doctors therefore, we are asking upon all our brothers and sisters in Christ for your help and prayers. Any donation is and would be appreciated from the bottom of our hearts. God bless you and your family. "With God All Things Are Possible"
Mathew 19:26 - Jesus looked at them and said, "With man this is impossible, But with God all things are possible".